Will America be as friendly to new arrivals as it always was? This week the USA Property Guide’s writer Amy Baker takes a look at how Americans welcome newcomers in the era of President-elect Trump and sifts the evidence to see if there has been a change. In January, President-elect Donald Trump will take the reins from Obama, and the world will watch on as this controversial character steps up to lead the most powerful country on earth. Part of Trump’s appeal to voters was his nationalism and “Americans-first” attitude, so would-be emigrators might be wondering where this leaves that warm-hearted embrace that America has traditionally extended to new arrivals. Has anything changed? Americans can be blunt – but this tends to come from a desire to get to the point quickly. Americans are an open and friendly bunch of people: hospitable and usually very relaxed. The larger cities won’t feel too dissimilar from London or Manchester in the sense that they are diverse, fast-moving, and people keep themselves to themselves while getting from A to B. The smaller or more isolated the location, the more you’re likely to be treated as a novelty, especially if the area that you move to isn’t one of the typical spots that expats choose for a new life in the sunshine. I spent four months living on an island off the coast of Maine. As a Brit who stuck around after the tourists had gone, I attracted curiosity. The questions came in thick and fast: Why was I there? What did I think of it? How could I afford to be there? What did my family think of me being so far away? This curiosity and readiness to ask any question that popped into their heads did catch me off guard occasionally, especially as I was often asked questions I wouldn’t dream of asking a stranger. No offence was ever intended though, so I responded by being as friendly and open as they were. You may find Americans seem blunt – but this tends to come from a desire to get to the point quickly, rather than from rudeness. Don’t be surprised if Americans are far quicker to discuss their status and wealth. For Brits, who are a little more reserved with this type of information, this kind of direct questioning can jar a little, but you’ll soon realise it comes from a good place. 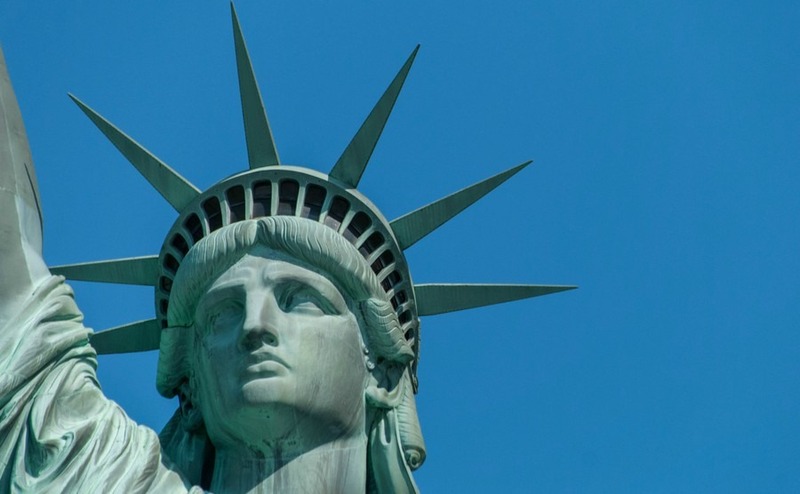 Lady Liberty, but is the welcome still as warm as ever? Much as we’ve grown up watching American comedy on our screens, Americans have also been influenced by our comedy too, from Benny Hill to Ricky Gervaise. There is common ground, but don’t be surprised if some of your jokes don’t quite land. Sarcasm and self-deprecation aren’t quite as widespread, especially in more rural locations of the US. As Stephen Fry explained: “American optimism is a really important thing. Not only optimism but a refusal to see oneself in a bad light. The American comic hero is a wise cracker who is above his material, and who is above the idiots around him. The British comedian would want to play the failure. All the great British comic heroes are people who want life to be better and on whom life craps from a terrible height and whose sense of dignity is constantly compromised by the world letting them down.” Why then, you may wonder, was the ultimate loser David Brent such a hit? Maybe because he kept on trying for success. Despite recent protests in response to police shootings, by and large Americans hold their police officers in high regard, and with good reason – it is a dangerous job. A Gallup study in October found that 76 percent of Americans have a great deal of respect for law enforcement. American cops can be more heavy-handed than the average British bobby, however, so it is sensible to display nothing but complete respect for the law. Don’t forget, it is perfectly lawful to openly carry a gun in some states. We have even heard of estate agents with a gun discreetly tucked away in an inside pocket. Try to play it cool! Religion is taken very seriously in most of the country, and is a huge part of the community dynamic. Around 70 percent of the country identifies as Christian, which means if you belong to the same church, finding a place to worship and make new friends is easy. Church congregations are incredibly welcoming and you will often find yourself invited to people’s homes. Trump’s promise to put the bust of Winston Churchill back in the Oval Office has got to be a good sign! Americans are also known for being fiercely patriotic – remember to stand for the National Anthem at sporting events – so it is best to keep any critical comments to when you’re with close friends (or maybe even to yourself!). Having said that, the success of British political comedian John Oliver just shows how welcoming Americans are and Trump’s promise to put the bust of Winston Churchill back in the Oval Office has got to be a good sign! The United States has always been a diverse country, with a population made up of people from many different ethnic backgrounds. To chat through your options for how to make your dream of moving to the USA a reality, contact our Resource Team today on 020 7898 0549.